VANCOUVER – It didn’t take long for Melissa Lacroix to admit her project might be cause for a little patriotic conflict. 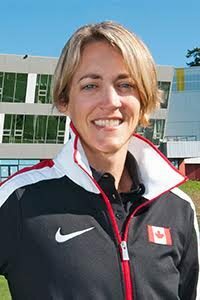 An Exercise Physiologist at the Canadian Sport Institute Pacific, Lacroix has worked closely with the Canadian Wheelchair Sports Association for the past four years, especially with Canada’s Wheelchair Rugby team, who are often pitted against their fierce rivals from the United States. For her recent paper, however, she was approached by her American counterparts to help strengthen the resources needed for a project that focused on the effects of vitamin D on elite athletes with spinal cord injuries. With a limited population of athletes to work with, bringing together spinal cord injured athletes from both countries was key, as the outcomes could potentially affect thousands. For Lacroix, the project offered an exciting opportunity to collaborate with researchers who have similar passions. Lacroix finished the paper this past summer, co-authored with Dr. Elizabeth Broad from the US Olympic Committee and Dr. Kelly Pritchett of Central Washington University. The study, titled 25(OH)D Status of Elite Athletes with Spinal Cord Injury Relative to Lifestyle Factors, involved 39 athletes from both indoor and outdoor sports from the Canadian Wheelchair Sports Association, as well as the US Olympic Committee Paralympic program. The study was conducted by assessing spinal cord injured athletes during the fall and winter, evaluating dietary and lifestyle factors, along with a separate test analyzing the difference in vitamin D among seasons. “From the athletes specifically, in terms of doing the protocol and vitamin D supplementation, it was something easy to implement to their daily routine that has a significant benefit to their health and performance,” noted Lacroix. Many people living with spinal cord injuries may be at increased risk for vitamin D insufficiency for a variety of reasons. For example, someone living in a wheelchair may have less exposure to sunlight due to immobility, decreased skin exposure and impaired thermoregulation. An inadequate diet and anticonvulsant medications are other challenges people with spinal cord injuries may face. Because of the multifactorial impact vitamin D has on bone health and the physical performance of the human body, it was important to develop a deeper knowledge of the vitamin D status for athletes with spinal cord injuries. This exact topic also caught the attention of another group of researchers in Europe. As Lacroix’s group published their study, a similar paper was also published from a group out of Switzerland. Lacroix has not had a chance to speak with the group from Switzerland about their respective projects, but is looking forward to pursuing more research in the field in the future. She and her American colleagues are currently working on a manuscript for a follow-up study that investigates the effects of a vitamin D supplementation protocol on 25(OH)D status in elite athletes with spinal cord injury. Lacroix’s research was presented in January at Canadian Sport Institute Pacific’s Research Share Day. Check out the video below for information about the Institute’s Research Share Day and Innovation & Research department.